One of the most common questions asked of biologists during the deer season is, "when is the peak rut in my area?" We can normally reply to that question with a reasonable amount of accuracy. Our accuracy is dependent on knowledge of deer behavior coupled with information that we have gathered from deer in, or near the area of question. The Wildlife Bureau Technical Staff, with the assistance of a multitude of conservation officers have been conducting deer health checks at specific sites within Mississippi for more than twenty years. These health checks are conducted to collect biological data that are unavailable from hunter-harvested deer. Some of the data collected at these health checks have included the conception or breeding date of the mature does that we examine. From this information we have been able to calculate the mean or average breeding date from a multitude of deer populations. We have found breeding dates to vary significantly from one region of the state to another. 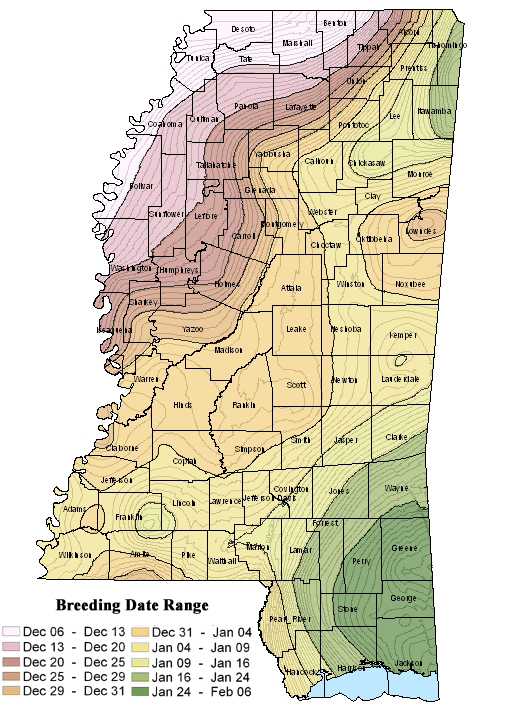 For example, the average breeding date in extreme SE Mississippi may be five weeks later than in some regions of the Mississippi Delta. The analysis of this information is exciting to us and becomes even more intriguing, informative and useful to hunters when it can be digitally referenced and then mapped. Jason Price, who is the director of our GIS Lab has made that possible. The associated map is the beginning result of that work. What you will see is a map of Mississippi that will give you the simulated mean conception date of any region you care to examine. Remember that the date(s) that you will be examining is the mean conception date, not the peak rut. Most deer behavior studies have shown that hunter-observable rutting activity peaks about two weeks prior to the mean breeding date. Therefore, this quest becomes quite simple for the hunter, who simply subtracts about two weeks from the mean conception date in his area, to obtain the simulated peak rut period. We do not guarantee that the date you calculate will be the peak rut in your area, it is a simulation based on the best information that we have. You will find your location simulated quite accurately if you are in the geographical periphery of one of our health check sites. Hopefully you will find this tool entertaining and useful. As you pursue deer during the breeding season this year, let us know how close the simulated date is in your hunting area.